Very modern, artsy and clean room in an apartment building as a B&B. Host was very helpful. She served us breakfast in bed! Nice touch. Only place in Italy that we had this service. The BnB has a real homely feel, only a 5 minute walk from the centre of Sorrento you’re the perfect distance from the life of the town whilst it’s still quiet at night. 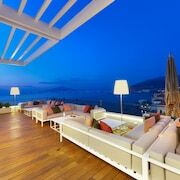 The property was located in a prime area of Sorrento. 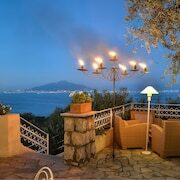 The terrace overlooking the bay of Naples is spectacular. The breakfast was outstanding and the service second to none. The facility was extremely clean, safe and a short walk 1 minute walk to the best shopping and restaurants.